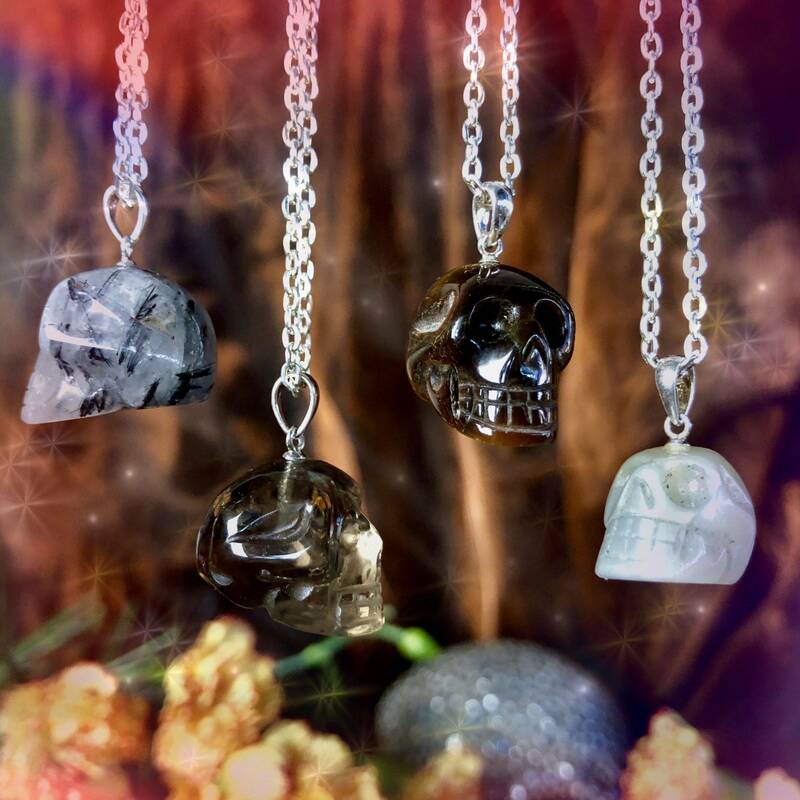 These skull pendants hold the dual powers of crystal medicine and ancestral connection. You know about the benefits of crystal jewelry, right? Wearing gemstone adornment is a beautiful practice for drawing the energy of your stones in a way that keeps you connected and attuned. And carved into skull shape, each pieces offers sacred observance to those who’ve passed on their wisdom and their very lifeblood to us. How do you celebrate your elders and ancestors? These skull pendants serve as a reminder of our loved ones who’ve come and gone, who now guide and walk beside us, separated from the living world by only a thin veil. (And that veil is coming to its thinnest point in October, during Samhain.) We work with skulls because they are companions to us. They hold our secrets, carry our wisdom, and even after we die, skulls are said to hold and channel what they learned from us in life, capable of transferring that information and wisdom to others. 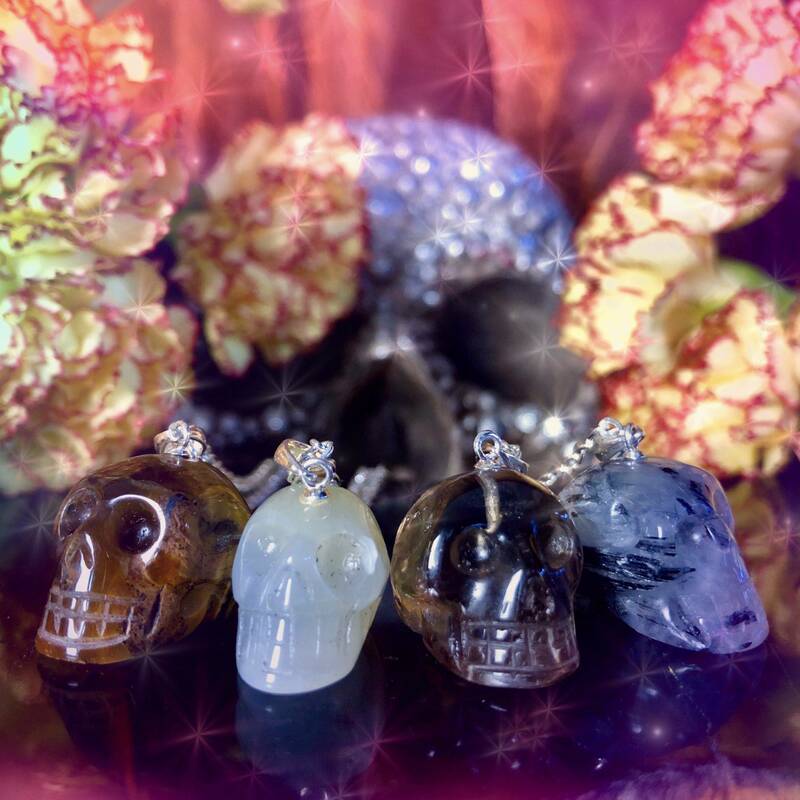 I am offering these skull pendants in your choice of four different gemstones: tourmalinated quartz for protection, grounding, and creation of safe space; tiger’s eye for protection, wisdom and soothsaying; smoky quartz for transmutation and healing; and moonstone for joy, harmony and releasing your inner light. 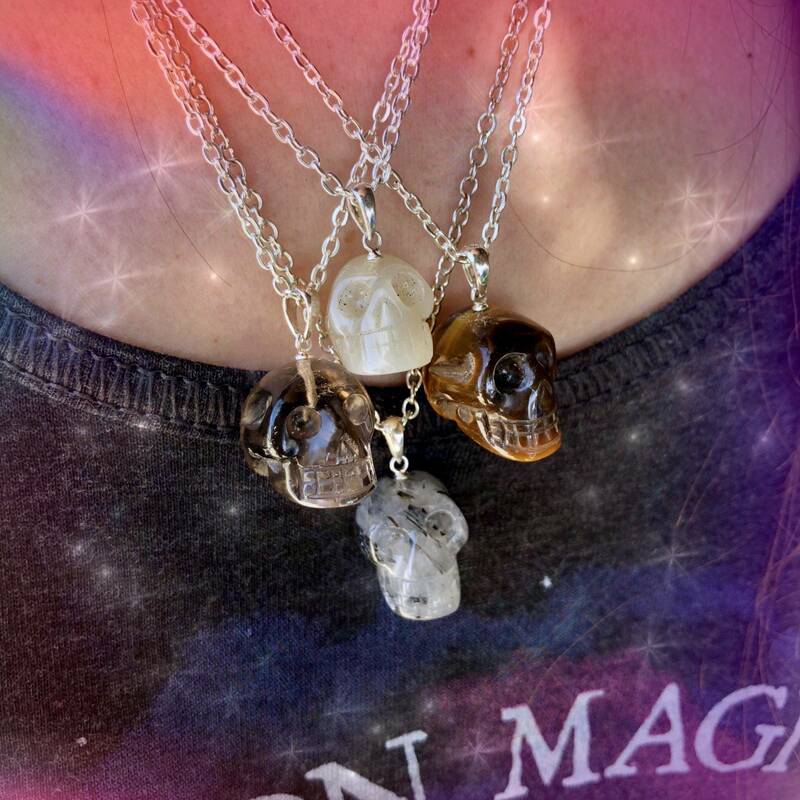 Wear your skull pendant as a symbol of past, present, and future generations; and all the wisdom we possess. As long as the stone is on you, emitting its vibration in your presence, you are tapping into its unique properties. This listing is for one (1) skull pendant on a silvery chain. I have four stone options to offer you: tourmalinated quartz (about 0.75”), tiger’s eye (about 0.75), smoky quartz (about 0.75”), and moonstone (about 0.75”). Please choose from the drop-down menu the option that calls to you. Yours will arrive lovingly parceled along with a single leaf of white sage and a card describing the properties of the stone.